If you find it a challenge to identify the right weight lifting benches for your need then you are not alone. One of the most important equipment that you will want to carefully research before purchasing for your strength training goals is the weight bench which is usually available in big varieties from different manufacturers. A decent weight bench would allow you to comfortably train without damaging your muscles or without causing you injuries due to not having proper posture when lifting weight for workouts. A weight bench is perfect for a range of different workouts, with and without weights for which you may want to refer to relevant sources for further tips. 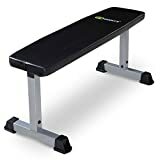 Below is a list of top 10 weight benches that you could select one from and this list is based upon the sales rank of each bench over at Amazon UK which is a preferred shopping destination for many. Pick the one that you believe would best serve your needs and you will be able to reach your strength training goals in no time. Weight benches are available from different manufacturers and they are designed with different purposes in mind catering to the workout needs of different categories and groups of fitness enthusiasts. The majority of home gyms require equipment that would be compact to help save space. This is why those looking for workout benches would prefer going for folding weight benches that would serve their needs better. Folding weight benches would themselves vary a great deal as they originate from different manufacturers who are well aware of demand for folding weight benches as people with workout needs would likewise have differing preferences when it comes to folding weight benches. Here is a quick list of the top 10 folding weight benches to help you identify the right model to invest your money in. This bench has an easily adjustable backrest that enables choosing either a flat or incline positions (7 adjustable position). 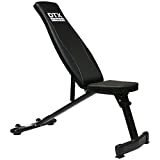 This multi-position bench can be used for training biceps, triceps, chest and shoulders. It can also be used as a sit up bench when placed in the decline position for an abdominal workout. It features extra thick cushioning for excellent comfort during the workout. The bench has a sturdy frame that ensures supreme durability and a maximum weight capacity of 250 kg. This bench comes with non slip grips. Comes with instruction manual Easy to Assemble. Dimensions (See Drawing): Overall Length: 110cm. Width At Widest Point: 59.5cm. Overall Height: 40cm. Padded Bench Width: 25cm. Padded Bench Length: 110cm. This SY-5430B multifunctional training station as a semi-professional strength training device you can train upper and lower body. Through various training courses, such as squats, bench presses, sit-ups, you can specifically train specific muscle groups. DIMENSIONS & Load capacities - Dimensions: (L x W x H) 160 x 121 x 120 cm; Folded: (L x W x H) 157 x 65 x 121 cm; Seat (LxW): 38 x 25 cm; Backrest (LxW): 75 x 25 cm; Elbow mat (LxB): 31 x 25 cm; Thickness: 5 cm; Maximum user weight approx. 120 kg. Versatile full-body workout with or without dumbbell. This multifunctional training station with adjustable weight bench, butterfly arms, curlpult, cable pull, dip bars, leg curl and barbell rack. Suitable for beginners, advanced and professionals. Thanks to its sturdy steel construction and exquisite craftsmanship, this model is a worry-free workout. Thickened steel tube, covered in a quick-drying surface of a powder color fast, by combining the safety with the stability, it will have been perfected. PRACTICAL: The compact-height multi-gym is foldable making it comfortable and easy to carry, set up and stow away. Particularly suitable for small interiors such as offices and apartments. GYM-QUALITY foldable weight bench provides stable support and comfort for variety of workouts. STRONG, DURABLE construction with high-grade steel. No more wobbles or unsteadiness. FOLDS EASILY and stores quickly under beds or in closets for ultimate convenience. 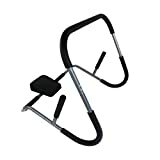 PERFECT for POPULAR EXERCISES like dumbbell presses, chest presses, tricep bench dips, and abdominal crunches. THICK CUSHIONING provides strong comfort and supports your core for a variety of training routines. ULTRA STRONG FRAME- The frame is made from high quality steel, which makes the weight capacity of bench up to 200 Kg. WIDE & THICK BENCH- The lengths of this bench is 107cm, width is 48cm, which provides more support for you. MULTIFUNCTIONAL USAGE- It is suitable for a wide range of workouts, such as sit ups, dumbbell & barbell workouts and push up. NON-SLIP FOOT CAPS- There are four rubber foot caps to protect steel framework from damaging floor and help keep the bench in position. 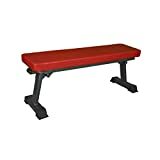 EASY ASSEMBLY- Comes with detailed instruction and necessary hardware,you can assemble our flat weight bench quickly,then you will have a practical and compact training bench! Weight benches can be of different types based on their features and size but they can broadly grouped into 3 main categories. Olympic weight benches, folding weight benches as well as adjustable weight benches. JIANGSU JUNXIA GYM EQUIPMENT CO.,LTD - Misc. While some may be okay with any foldable weight bench, you will find fitness enthusiasts and bodybuilders looking specifically for a range of folding weight benches including, a folding weight bench under bed, which they can store under their beds after use which would obviously require a bed with a good enough frame height to allow storage space underneath, a compact folding weight bench which does not occupy much space during use or when stored, a portable weight bench which can easily be carried and moved around, a stow away weight bench which can be pushed away into storage after use, a travel weight bench that may be good to travel along with without having to put a break to your workout routines, or a folding weight bench with rack to hold other fitness accessories such as weights, barbells and dumbells which are essential for effective workouts using weight benches. 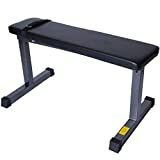 Manufacturers from different countries seek to understand the needs of fitness experts in terms of what would make the right workout equipment for different types of exercises and the above list of top 10 folding workout benches is a result of what these manufacturers have managed to gather from feedback as being what the majority of weight trainers have shown demand for. 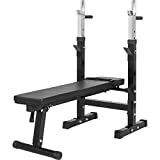 You can find their ratings and reviews to give you an idea on how each of the above listed folding weight bench or folding workout bench as others like to refer to it as, would meet your specific workout needs. Adjustable weight benches are weight lifting benches that can be adjusted to suit different types of workouts. So, instead of going for multiple weight benches with different inclines and backrests, you could be investing in just one that can be adjusted for different users and different workouts and exercises. One of the things that make an adjustable weight bench important is lack of space where you intend to use it. Most home gyms are quite restricted in space which is why folding and adjustable weight benches of different designs and types prove extremely useful. 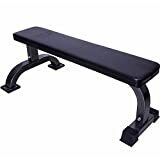 However, you may obviously perhaps get the best result out of a rigid, sturdy and stable weight bench and when portability isn’t an issue as in the case of commercial premises or professional gyms requiring a variety of workout equipment, you may not necessarily find comfort with folding weight benches when you have plenty of space available for the best of their kind weight benches. In short, folding wight benches are ideal for home gyms when space is an issue. 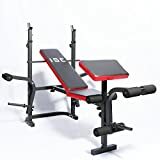 It is important for people investing in a folding adjustable weight bench to be disciplined and follow a specific workout routine without fail. Anything that is foldable and that is stored away adds to the laziness of people trying to use it. So, you will find it easier for people to workout on weight benches that are already set up as opposed to locating where they have it stored and trying to setup before use. It is easier to procrastinate and affect your workout routine if you are not disciplined. 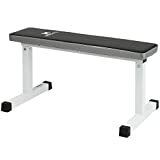 However, folding weight benches are one of the best equipment that you could invest in to enhance your workouts and if you choose a comfortable bench that can handle the total weight of your body along with any weights that you intend to lift, then you will have the best of experiences possible. An olympic weight bench is more of a bench set that is designed for advanced users. It is wider and longer than normal weight benches and comes with a rack too so that you do not have to purchase it separately to store weights and barbells. You could use an Olympic weight bench for a range of different advanced workouts including the bench press. So, Which Is The Best Weight Bench? There are countless varieties of weight benches available but everyone seems to be after the best regardless of what their budget might be. This is why it becomes difficult to decide which is the best weight bench unless you consider all factors that you should be putting into consideration. The best weight bench much be easy to setup and fold and should be easily done by one person. You should check the total weight that a folding weight bench can support before going for one as this is an important factor for safety. A folding weight bench that does not have too many small moving parts would be ideal as various injury risks can be eradicated. Read the installation booklet that comes along with your weight bench so you can install it correctly and use it as recommended to eliminate risks that could cause injuries. It should also come with manufacturers warranty so you can be sure it is guaranteed to work efficiently. Once you have invested in a decent weight bench, be it folding or otherwise, you will not feel the need to have to go for another one anytime soon.